The improved quality of recycled plastic products over their virgin counterparts, the push from different companies, and strict governmental regulations are the main drivers of the recycled plastic market. Persistence Market Research in its upcoming report titled ‘Recycled Plastic Market: Global Industry Analysis 2012 – 2016 and Forecast 2017 – 2025’, projects the recycled plastic market to be worth just over US$ 30 billion by 2025. The polyethylene terephthalate and high density polyethylene resin types had a market share approaching 2/3rd of the recycled plastic market and should gain 180 and 40 BPS respectively, largely at the expense of other resin types. Polyethylene terephthalate is popular primarily on account of its low price and versatility. Similarly, a large portion of the plastic scrap generated including margarine tubes, grocery bags, and detergent bottles contain HDPE resins. The packaging industry is anticipated to hold the maximum share in the recycled plastic market by application type in terms of both value and volume. 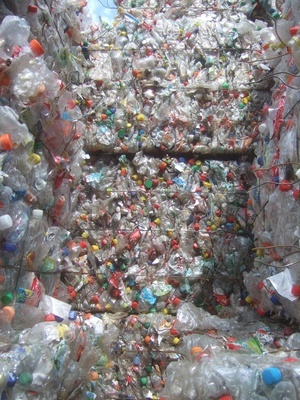 There is heavy demand for recycled plastic in the packaging industry because most waste scrap is generated by the packaging sector and then recycled to manufacture PET containers, bottles, carpet fibers, and clothes. The packaging industry is predicted to record a CAGR of 4.8% throughout the forecast period. Companies such as Nestle and Coca Cola have begun to use recycled plastic bottles for packing beverages and they have pledged to use more recycled plastic content in their beverage bottles instead of virgin plastic. Plastic bottles are on track to witness a CAGR of 4.8% from 2017 to 2025 and should exceed 17,000 KT by the end of the eight-year study, making it imperative for key stakeholders in the recycled plastic market to target. APEJ is estimated to fuel the volume gains in the recycled plastic market over the forecast period with a total incremental opportunity of just under US$ 3.3 billion being attributed to this populous continent. The consumption of recycled plastic products is concentrated in APEJ particularly in the construction and packaging sectors. In China, the raw material availability is very less leading to increased consumption of recycled plastic. Rapid adoption of recycled plastic in the packaging and textile sectors could propel the recycled plastic market in the near future. The construction and automotive industries have also seen a boom period that in turn spurs spending on safe plastic products directly benefiting demand for recycled plastic. In conclusion, industrial production in emerging economies has contributed to the global recycled plastic market.